You must have guessed, this motor base made in Japan. Big mistake. Instead, the original production of China, Dayang brand. In fact, the original model is a duck. Motor is owned by Aditya Wisnu Wardana from Banyumas, Central Java. He wanted to be a supermoto bike overhauled. For cultivation, it was entrusted to Suswanto from Billy's house Custom modifications (BC). As the virus spread WJS, Suswanto streetfighter still a touch of the artificial motor is 2006. His intention, this bike streetfighter want full contrived. 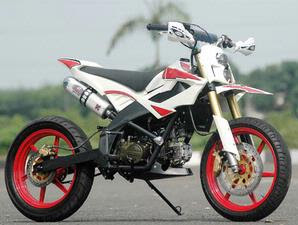 However, Adit wanted for motorcycle supermoto style is often used wara-wiri Purbalingga-Purwokerto. So, he took the motor for high mobility multi-function and style, "explained Wanto, call Suswanto slang. From duck a model supermoto obviously needed a lot of changes, including the design of the framework. In materials, the original frame must be replaced. In fact, the top Underbone added to the main frame of a stronger material. The main point behind komstir, then pulled back until the bottom of the seat. New bone is multifunctional. In addition to the tank and seat upholstery, new bone was once a major new order. That way, the motor seemed more solid. In order to view sangar added, add DELTABOX Wanto variation of 2-inch pipe material, making the center looks solid. Changes Bodi, without offset changes in the legs, of course not get perfect results. For the front legs, part of the Honda GL dikanibal-Pro with the consideration of stronger and taller. This form is suitable to build a supermoto form.